It is hard to determine the cultural origin of the Iceman because the find is absolutely unique. There is an absence of any pottery, but links can be make between the organic objects and the late Neolithic and early Bronze Age. A flint dagger and stemmed arrow heads were found in a man's grave in Remedello. The Tisenjoch axe does correspond to the copper axes found in the area after which the culture was named, Remedello, near Brescia. The spreading of the Remedello culture into the South Tyrol can be proved by the discovery of flint daggers and flat copper axes. The Senales Valley. The Similaunspitze (summit) is in the background. Because of the Iceman's axe, he can probably be classified as a cattle owner or village chief. Searching for ore also fits into his possible range of activities. From Senales to the Ötztal. 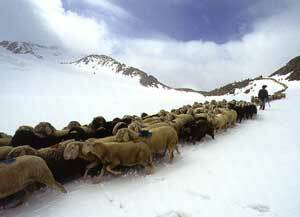 Alpine pastures were subject to human influence through stock farming as early as the 4th millennium B.C. The link between the Tisenjoch find and the Ötztal pasturelands should be mentioned because they are now, and were then, tended from Val Venosta. Digested pollen of the beechtree, which only grows south of the Alps in the Val Venosta, was found in the Iceman's large intestine. Also, the grain that the Iceman came in contact with was grown in the area around the settlement. 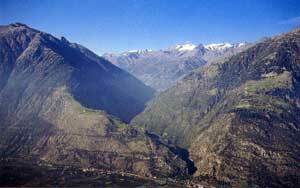 Therefore, it can be assumed that the Iceman lived in the Val Venosta. 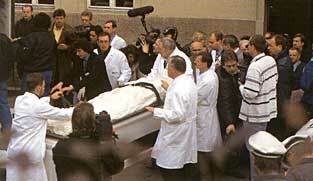 The Iceman and his belongings were transported from the Institute of Anatomy of the University of Innsbruck to his permanent home at the South Tyrol Museum of Archaeology in Bolzano, Italy on January 16, 1998. 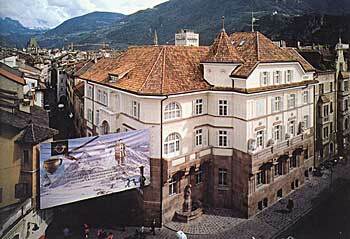 The new South Tyrol Museum of Archaeology documents the entire ancient and early history of the South Tyrol through ancient, middle Stone Age, and Carolingian Age. The Iceman, his tools, equipment, and belongings occupy the entire first floor of the museum. The mummy is kept in a specially designed cold storage unit. The "Iceman box" consists of a decontamination room, examining room, and two adjoining identical refrigeration chambers with independent cooling systems. The Iceman is now stored at -6° C at almost 100% humidity. 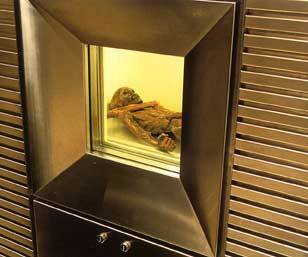 The cold chamber is not open to the general public, but the public can view the Iceman at the South Tyrol museum through the little window.